With over 4,000 species of frogs and toads in the world, you’re bound to find a few that stick out as being weird, creepy, bizarre, and down-right horrific. 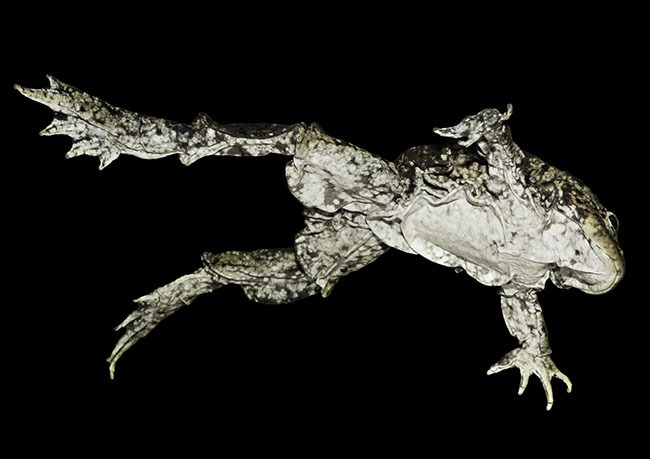 That’s what this article aims to uncover; the weirdest frogs and toads on earth. Frogs and toads are amphibians but more specifically, they belong to the Anura order. Anura is the translation of an ancient Greek word meaning “without tail”. These tailless amphibians are found all over the world, inhabiting every continent except Antarctica. They evolve and adapt to the conditions of the places they live, resulting in unique appearances and strange behaviors. From weird shapes and colorations to gliding tree frogs and transparent skins, these are the weirdest frogs you have to see to believe! 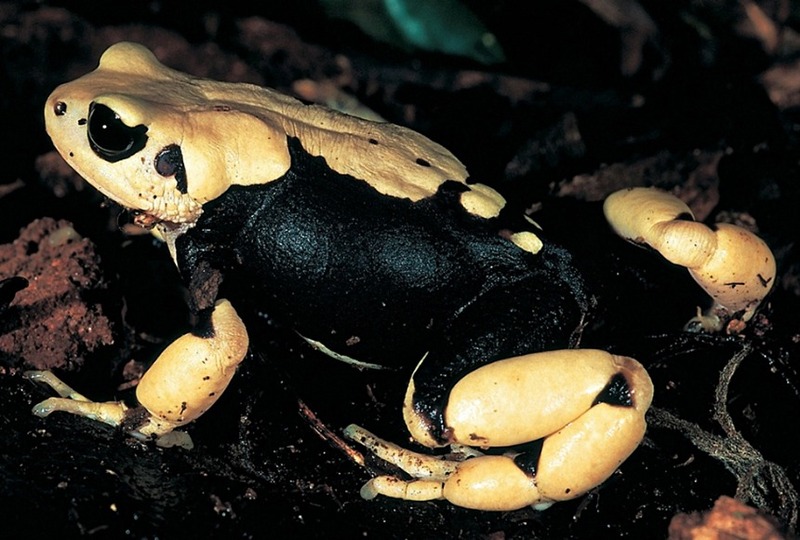 In this section, I’ve listed strangest, most bizarre frogs from around the world. I’ve spent several hours researching and writing about the species below and it’s been a blast. I hope you enjoy my findings as much as I enjoyed writing about it. Keep in mind, the frogs and toads in this section have evolved over time into the amazing species they are today. The last section is simply a bonus; one you don’t want to miss. 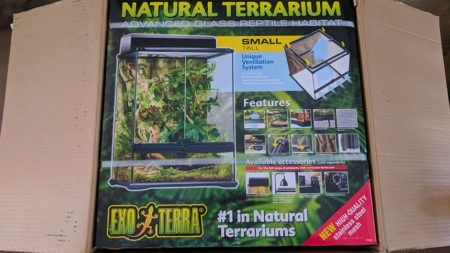 It contains just one frog, but I’ve intentionally placed it in its own category because it’s a mutation; likely the result of chemical pollution. The Hairy frog or “Horror frog” (Trichobatrachus robustus) is definitely the most ghastly frog on this list. Not because its strangely placed hair makes it look weird or anything, but because of its spine-tingling defense mechanism. 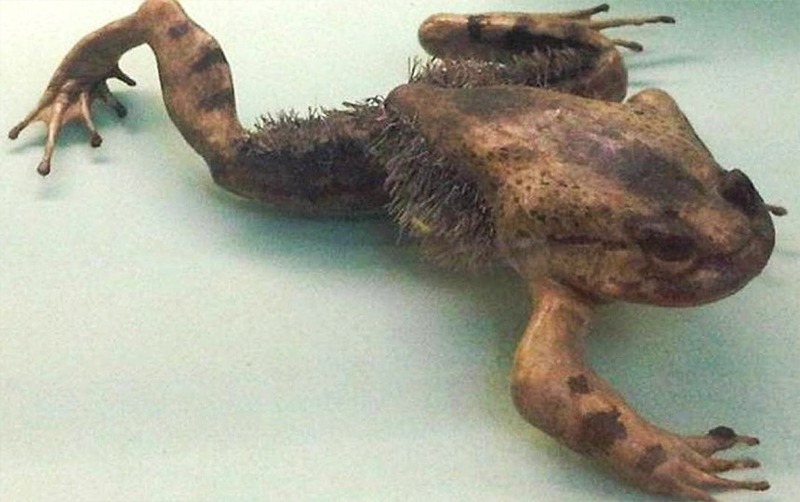 You see, the Hairy frog literally breaks its own bones to produce claws. Some frogs blend into their environment, others are poisonous, but the hairy frog intentionally breaks the tiny bones in its pads (fingers or toes) to produce small barbs, or claws, for self-defense. Scientists have yet to determine what happens to the bones afterward. A popular theory suggests the bones eventually slide back into the toe pads as their muscles relax. The most notable feature, however, is the hair coming from their torso and thighs. In fact, they’re not hairs at all. Its called dermal papillae and they contain arteries which are thought to help with the absorption of oxygen in the water. The dermal papillae work much like external gills and they’re only found on breeding males. 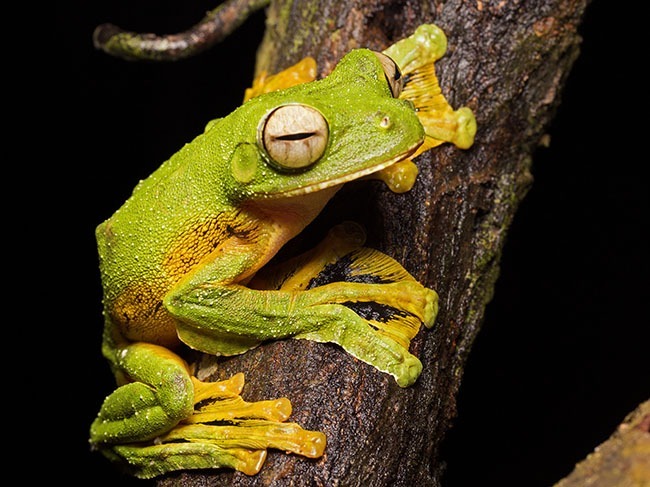 Wallace’s flying frog (Rhacophorus nigropalmatus) is also known as Abah River flying frog or simply “gliding frog”. This species survives in the dense jungles of Borneo and Malaysia, spending a large majority of their time in trees. Adults grow up to 4 inches in length and sport a bright green, white and yellow coloration perfect for its natural environment. Their webbed feet are peculiar, having membranous, loose skin between their toes. This gives Wallace’s flying frogs the ability to glide from one place to another, often in search of prey or to escape incoming predators. They can glide 50 feet or more and have oversized toe pads for landing. While Wallace’s flying frogs are not the only species to develop the ability to glide, they are, in my opinion, the most photogenic, being brightly colored all-over aside from the black color in between each pad. The common Suriname toad (Pipa pipa) goes by many names; star-fingered toad, aparo, sapo chinelo and sapo pipa to name a few. It survives in swamps and freshwater marshes throughout the Northern regions of South America. This toad is unique in many ways, the first of which is its shape. The Suriname toad is almost completely flat, having the color of a leaf. It has tiny eyes, no teeth or tongue, and has star-shaped appendages on its front toes. While their appearance is certainly weird, it’s not what they’re known for. 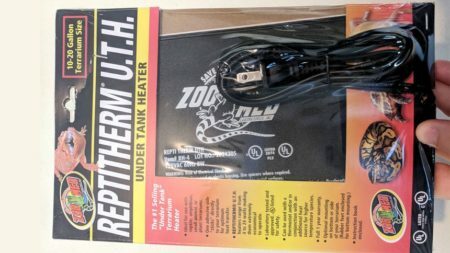 They’re best known for their method of reproduction. You see, most frogs reproduce by laying gell-coated eggs in or around water. The female releases eggs through its cloaca while the male fertilizes the eggs outside the body. That’s not the case with the Suriname toad. Their method is quite different and kind of creepy. 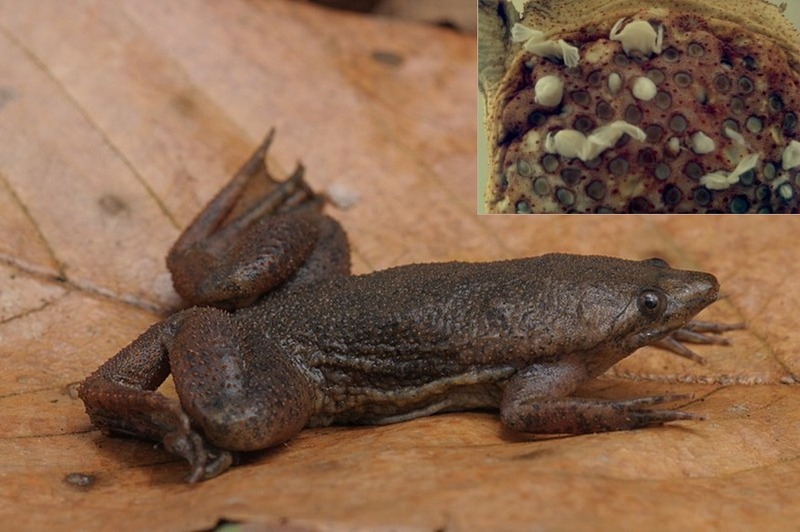 For Suriname toads, the female releases her eggs only for the male to embed them into her back. The fertilized eggs remain embedded in her back until they’re fully developed toads. Eventually, the baby toads emerge from their mother’s back to begin their lives. The Purple frog (Nasikabatrachus sahyadrensis) or “Pignose frog” hails from the Western Ghats in India. They’ve remained somewhat of a mystery over the last 100 years. Their tadpoles were first described back in 1918 while the adult frogs were well-known to the local peoples. These reports were strictly ignored until 2003 when S.D. Biju and Franky Bossuyt documented the species. But why were they ignored for so long and what’s the story behind this weird looking frog from India? The answer is quite simple, actually. The Purple frog burrows underground and remains hidden for much of its life, only returning to the surface to mate during monsoon season. 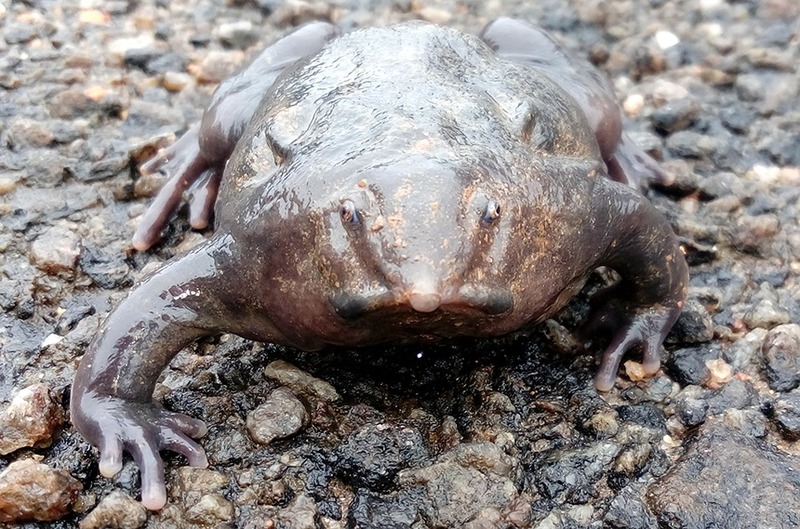 With a lack of field researchers outside during the rainy season, the Purple frog has gone undocumented for all this time. 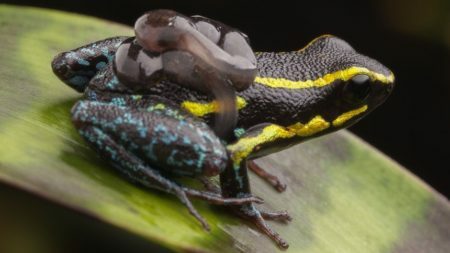 When they make it above ground for mating, the male Purple frogs, which are quite a bit smaller than females, hitch a ride of the female’s back. The female finds a suitable location to lay her eggs while the male fertilizes them. The Amazonian horned frog (Ceratophrys cornuta) is without-a-doubt one of the most bizarre frogs on earth. I would almost consider its over-sized mouth and stumpy legs somewhat comedic if it weren’t the menacing horn-like extensions above its eyes. It’s weird how their appearance is both humorous and scary at the same time. Aside from their obvious features, their coloration mimics that of a dead leaf. Most of them are several shades of brown but they also come in a green coloration. This particular species is part of the Ceratophrys genus which is commonly known as Pacman frogs. The genus has eight species which inhabit a variety of different locations, having small differences in appearance and size. The Amazon horned frog, also known as the Surinam horned frog, can grow up to 7.9 inches in length and weigh up to 1 pound. Amazon horned frogs are carnivores, feeding on a variety of other frogs, snails, lizards and sometimes mice. They ambush prey by hiding in leaf litter, having only their heads exposed, and waiting for a potential meal to walk by. When the opportunity arises, the horned frog snatches up its prey in a single bite. 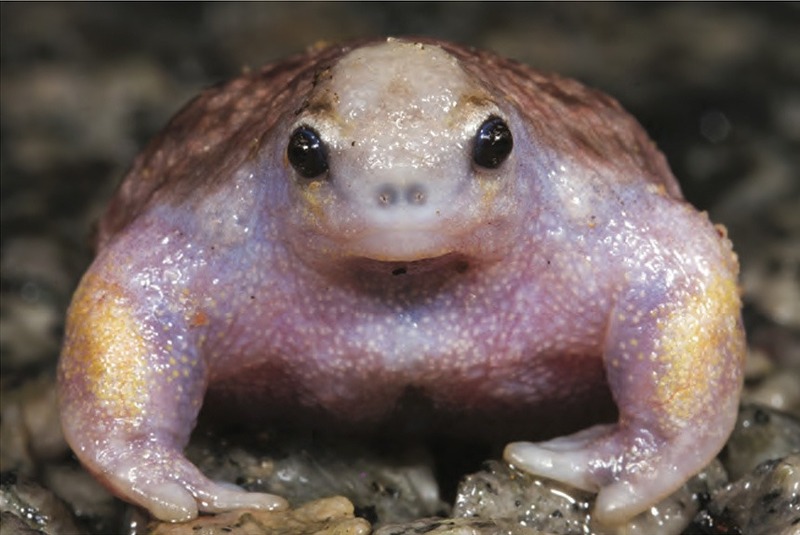 The Turtle frog (Myobatrachus gouldii) gets its name from having an appearance like that of a turtle with no shell. It sports short, stumpy legs, beady eyes, a flat nose and a plump, flat-shaped body. Basically, everything nightmares are made of. And if that wasn’t enough, they also have weird claws on their legs. This frog is native to Australia, usually found between the Fitzgerald and Geraldton River in semi-arid, sandy areas. It is also the only species in the Myobatrachus genus. Another interesting feature unique to this frog is its ability to dig forward. All other burrowing frogs use their hind legs to dig backward. And much like the Purple frog, the Turtle frog feeds almost exclusively on termites. This funky looking frog is the Titicaca water frog (Telmatobius culeus). It’s one of the world’s largest aquatic frogs and certainly earns its place in our list of weird frogs due to its excessive amount of skin. The saggy, flappy skin aids in respiration due to its small lungs. In fact, the Titicaca water frog’s skin absorbed so much oxygen from the water, it never has to resurface to breathe air. The locals joking call it the “Titicaca scrotum frog” in reference to its outlandish skin. This species is found in the cool waters of Lake Titicaca, which sits on the border between Bolivia and Peru. Due to pollution and the introduction of trout, which are rapidly consuming the tadpoles, this species is now critically endangered. To make matters worse, over 10,000 Titicaca water frogs were found dead on the shores of Lake Titicaca in the month of October 2016. While the cause is still unknown, scientists speculate pollution is the reason. Glass frogs get their name from the transparent skin on their abdominal region. The skin is actually see-through, allowing you to see their beating heart, intestinal tract, liver, and veins. Glass frogs belong to the family Centrolenidae, in which there are two subfamilies containing several species inhabiting Central and South America. Male reticulated glass frogs protect their offspring by guarding the female’s eggs. Females will lay their clutch of eggs on the underside of a leaf and then the male protects them from predators until they hatch into tadpoles. While the adult glass frog has one of the best Camouflages in the world, the eggs are easy targets for wasps. Unfortunately for the wasp, the glass frog is a ferocious fighter with a strong kick and they’re not afraid to fight back. 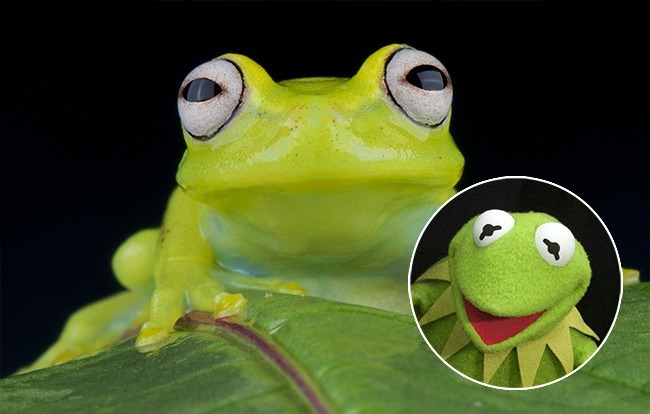 The discovery of a new species of Glass frog has stirred up a lot of excitement in the amphibian & muppet world in recent years. 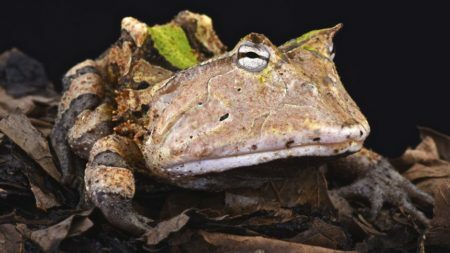 The Hyalinobatrachium dianae has adapted the common-name “Kermit frog” due to its similarities to Kermit the Frog. With its lime-green color and large, white eyes, it’s easy to see why people are calling it that. The “Kermit frog” was discovered in 2015 on the foothills of Costa Rica. The Morogoro tree toad (Nectophrynoides viviparus) is such a fascinating species. In my opinion, it looks like a small frog but it is, in fact, a true toad from the Bufonidae family. They come in a wide array of colors but one thing they all have in common is the small mucous glands all over their bodies. Paratoid glands are found directly behind their eyes, just beside their tympani (circular hearing structures). The paratoid glands often contrast the color of their body, which makes them stand out even more. This species grows up to 2.4 inches in length and has partially webbed feet. They are native to regions of Tanzania between the Udzungwa and Uluguru mountains. Most of their days are spent among bamboos and wooded areas nearing forest edges at altitudes over 4,400 feet. Back in 2004, the IUCN threat status for Morogoro tree toads was Vulnerable (VU) but was recently changed to Least Concern (LC). It’s always good news to see a once-endangered species making a recovery! Shovel-headed Tree frogs (diaglena spatulata) are known in Mexico as “Mexican Shovel-headed frog” and for good reason; they’re native to Mexico, found along the Southwestern coastline and, of course, their face kind of looks like a shovel. This species is very similar in appearance to that of the Aparasphenodon genus which hails from Southeastern Brazil. Both species have the weird, duck-bill shaped nose that jet’s out of their face’s like Pinocchio claiming to be a “real boy”. The diaglena spatulata inhabits shrublands and tropical forests, reproducing in freshwater bodies left by spring-time rains. The South American Common Toad is known as the Mitred toad, crested forest toad and probably a handful of other “common names”. Its scientific name is Rhinella margaritifera and it’s considered species complex. This means there are probably different species being labeled as margaritifera but herpetologists haven’t studied them enough to differentiate them. These toads are common in South America throughout Guianas, Panama and the Amazon Basin. Their shape and coloration give them one of the best camouflages in the world. At first glance you may never see them, having mistaken them for a fallen leaf. Most people can only find them when they move. Because they are in a complex species, their colors vary greatly. Some have the colors of a dead leaf, one has a bright vertebral stripe, and the others are a mixture of bright and dark colors. 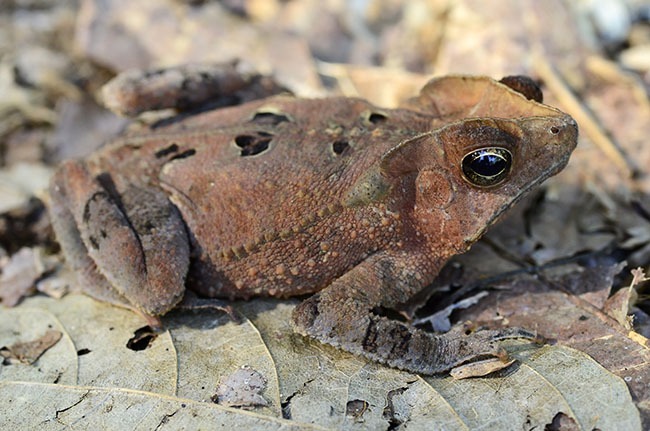 This particular frog (the one pictured above) has an eccentric cranial crest and reddish-brown color, perfect for blending in with leaf litter. 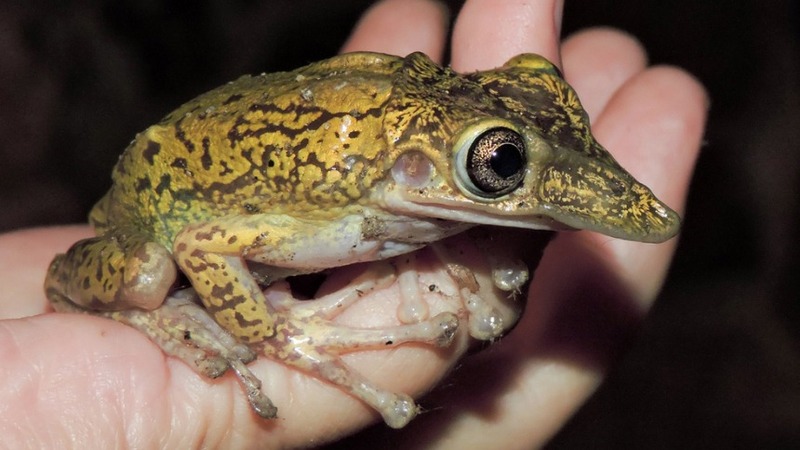 The Darwin’s frog (Rhinoderma darwinii) is a bizarre little creature for more than one reason. At first glance, this species appears to be involved in look-a-like contest with fallen leaves. They range in colors between bright green to brown and sometimes gray. Regardless of the coloration on top, their underside is always dark brown; the perfect color combo to mimic that of a fallen leaf. Not only do Darwin’s frogs have fascinating colors, their pointy, elongated snout makes them stand out as unique among the amphibians of the world. But even its nose is not the most outlandish feature this species is known for. You see, this frog is known for something entirely different; its weird reproduction habits. 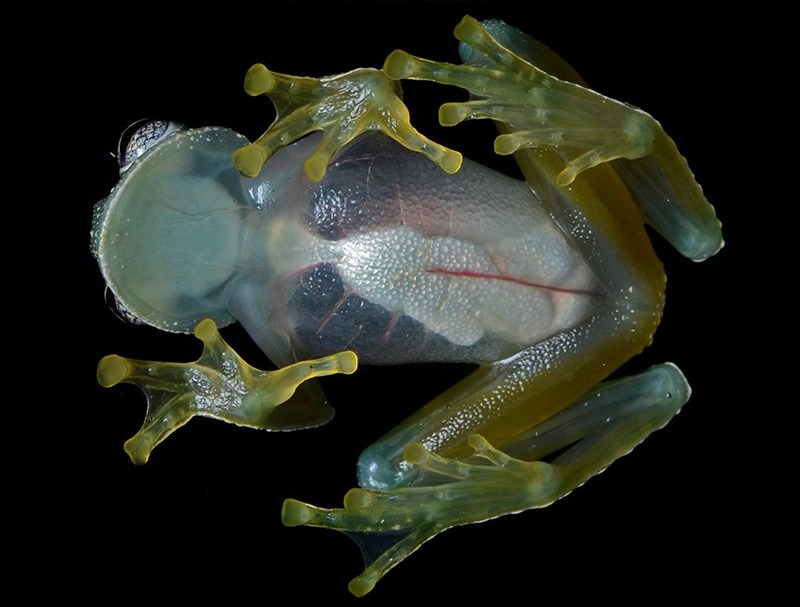 Much like the Glass frogs, male Darwin’s frogs guard their offspring against predators. They take things a bit farther, though. They guard the clutch of eggs until it begins moving, at which time they ingest the eggs into their mouths; the eggs are stored in the male’s vocal sac. Eventually, the eggs hatch into tadpoles and they remain in their father’s vocal sac all the way through metamorphosis. Once they’ve developed into little frogs, they hop out of their dad’s mouth and begin their lives! You’ve probably seen this video already but in case you haven’t, it’s definitely worth the 29 seconds it takes to watch. This is the Desert Rain Frog (Breviceps macrops), the cutest frog that ever lived. You might be wondering why it’s listed among these other weird and creepy frogs. After all, it’s just so darned cute! However, if you peel back the cuteness of the Desert rain frog, you’ll find a species which displays some rather ghastly behaviors. The Desert rain frog doesn’t jump, it squeals loudly when threatened, and completely bypasses the tadpole stage. Yep, that’s right, the Desert rain frog is a complete rebel. It fully develops within the egg without going through the tadpole stage. 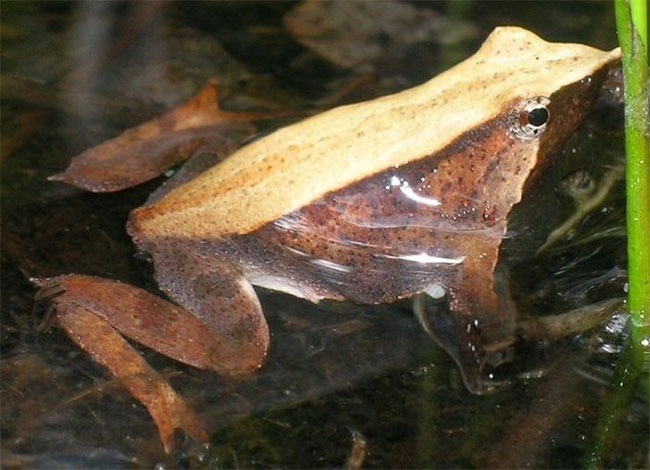 All jokes aside, these cute little frogs are currently listed as Near Threatened (NT). They inhabit a small stretch of sand near Namibia where they spend their days burrowed underground, only coming to the surface at night to eat insects and do frog things. 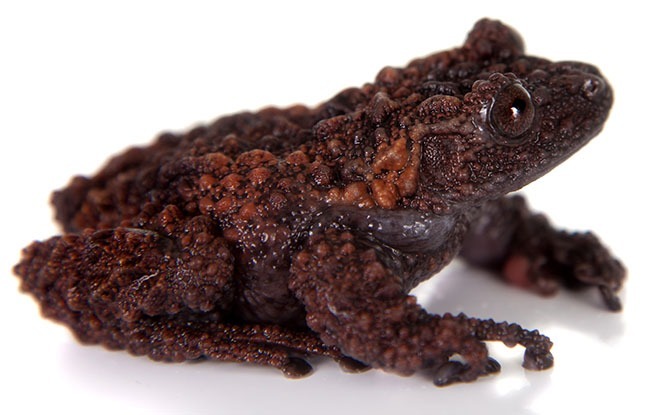 Gordon’s warty frog (Theloderma gordoni) earns its spot among the world’s weirdest frogs for a handful of reasons. As you can see in the picture above, they have a bumpy dermis, large eyes, and a magical coloration. This species hails from Vietnam, inhabiting evergreen rainforests along rocky, limestone cliffs surrounded by water and dense vegetation. If you’re familiar with the Theloderma genus, you might be wondering why I chose the gordoni species over the Theloderma corticale (Vietnamese Mossy Frog). My answer is this; I chose this species over the other because of its color. Green frogs are common while red frogs are not-so-common. In fact, there are little differences between the two! 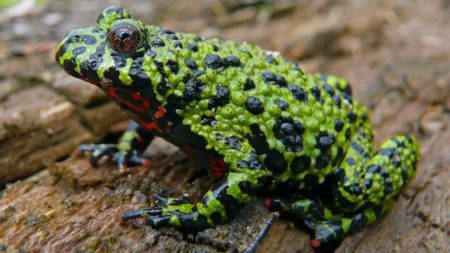 The coloration of mossy frogs, accompanied by their bumpy skin, produces one of nature’s best camouflages. If that weren’t enough, this species has another tactic it uses to fool predators. Gordon’s warty frogs, when threatened, roll over and play dead! The Goliath frog (Conraua goliath) hasn’t earned its place here by its strange looks or unusual behaviors. No, it’s on this list because of its supernatural size. While American and African bullfrogs are massive in size compared to most frogs, the Goliath bullfrog is even bigger. From snout to vent, these frogs can grow up to 12.6 inches in length; this does not include their legs. Also, they weigh over 7 lbs when fully matured. 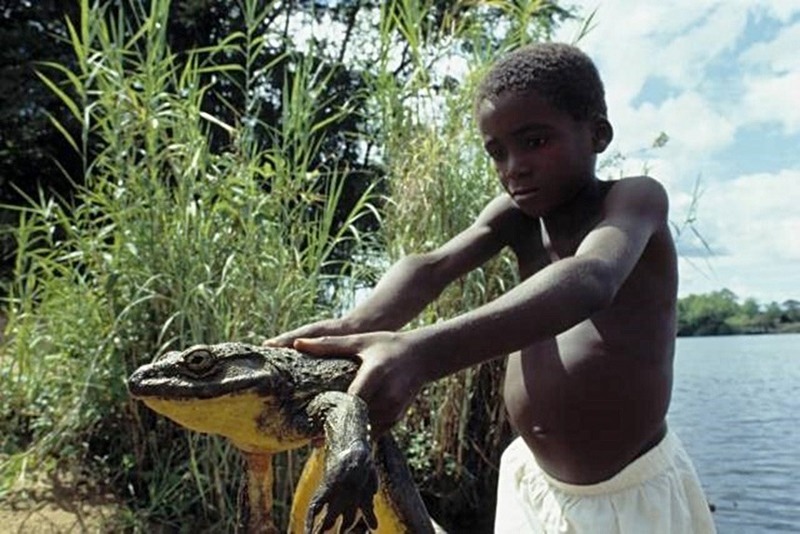 Other than their incredible size, the Goliath frog is much like other bullfrogs, living near rivers and streams. They live up to 15 years in the wild and feed on a variety of insects, small snakes, lizards, and crabs. The final frog on this list comes as a bonus because the original species is unknown and, as the heading suggests, they’re mutated. While the exact cause of the mutation is unknown, researchers believe pollution is to blame. The Ural Federal District University obtained 60 mutated frogs from the town of Krasnouralsk, Russia. 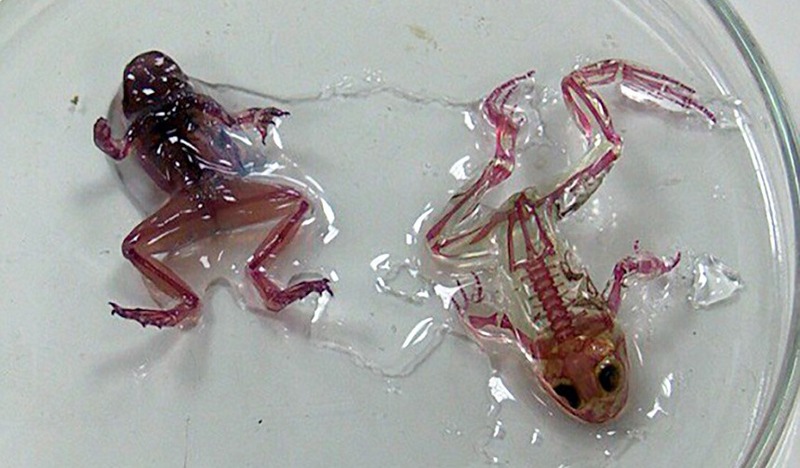 Some of which, like the ones in the pictures, have completely transparent skin. You can see their organs, skeleton, and everything else. Some of the other frogs collected had mutations on their shoulders and extra toes. All of them have pitch-black eyes. The town of Krasnouralsk was plentiful in natural resources during the 1800’s with mining operations extracting gold, copper, iron, and coal. Dr. Vershinin, the head Zoologist from the university, mentioned that chemicals leaked from storage containers into the nearby water supplies. 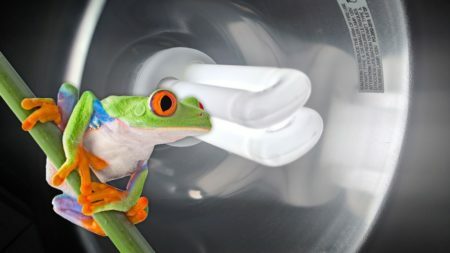 He also went on to explain that the mutation in the frogs is likely due to the pollution, but that it could be a result of parasitical larvae entering the tadpoles. While it’s disheartening to see the effects of human pollution on these frogs, I felt they were certainly fitting for this post. I hope you enjoyed looking at the world’s weirdest frogs and toads. If you liked this article, please consider sharing with your friends and family!